Beautiful 3 bedroom 2.5 bath condo with a 2 car garage in Eastlake. Located in the gated community of Capria in a lovely parklike complex which includes pool, spa and park. This beautiful condo has tile entry, hard wood floors in the living room, dining room and staircase. White wood blinds on windows, ceiling fan in living room, laundry downstairs with gas hookup for dryer. Kitchen has Corian countertops with backsplash, maple cabinets and stainless steel appliances. 1 bedroom on main level and 2 bedrooms upstairs. Huge master bedroom with 2 walk in closets with double sinks and maple cabinets in master bathroom. Central AC. Close to schools, parks, dining, shopping and freeways. Find out more about this “Coming Soon Property” in Eastlake, Chula Vista. 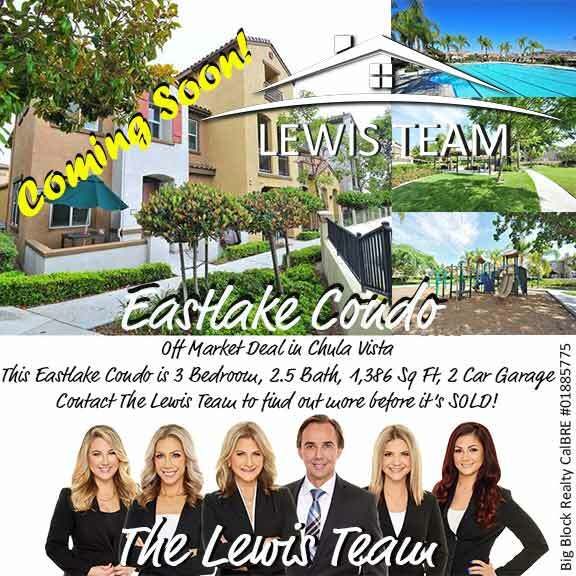 Contact The Lewis Team to tee see this “Coming Soon” Home in Chula Vista before it goes on the market! The Lewis Team San Diego Real Estate Experts!